Swimming is one of five sports that have been contested at every summer Olympic Games since 1896. The others are: Athletics, Cycling, Fencing, and Gymnastics. For the 2020 Games in Tokyo, there will be a total of 35 swimming events in the pool, 17 events for both men and women, and a 4 × 100 metre medley relay mixed. The 2020 Tokyo Games will include for the first time the women's 1,500 and the men's 800, finally equalizing the available events for men and momen. The other swimming event at the Olympics is the marathon 10km open-water swimming race for men and women. In 1896, a boat dropped everyone into the icy waters of the Mediterranean, and the first swimmer to shore won. That first gold medalist in swimming was Hungarian Alfred Hajos. The 1900 Paris swimming events were held in the River Siene, which meant that the contestants had to contend with the current too. 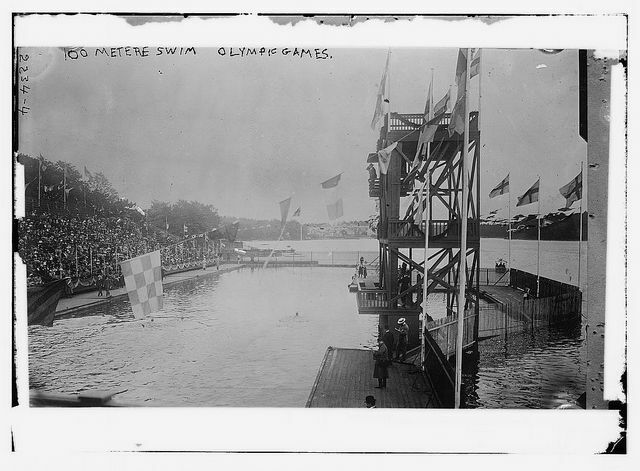 There have been some unusual swimming events at the early Olympic Games, including the plunge for distance, underwater swimming race and the swimming obstacle race. Women competed in swimming events for the first time at the Olympic in 1912, but none of them were from USA, as that country did not allow its female athletes to compete in events without long skirts. In 1924, Johnny Weissmuller won three golds and a bronze in water-based events; he later became known for playing Tarzan at the movies. In 1936, Denmark's 12-year-old Inge Sorensen won a bronze medal in the 200-meter breaststroke, making her the youngest medalist ever in an individual event. The Butterfly event in swimming was "invented" for the 1956 Games after some swimmers had begun to exploit a loophole in the breaststroke rules. In 1996, Amy Van Dyken of the U.S. won four gold medals in swimming. Also, Ireland's Michelle Smith won three golds and a bronze in swimming. Smith was accused of using performance-enhancing drugs; this remained unproven, but she was suspended in 1998 for tampering with a urine sample. Mark Spitz from USA won seven gold medals at the Munich Games in 1972, and won them all in world record time. In 1980, Russian swimmer Vladimir Salnikov became the first swimmer ever under 15 minutes (14:58.27) in the 1500m freestyle. In 1984, US Swimmers Nancy Hogshead and Carie Steinseifer registered the first tie in Olympic history in the 100-meter freestyle. Both swimmers touched the wall at 55.92. In 2000, 17-year-old Ian Thorpe of Australia won four medals (three gold) in swimming, breaking his own world record in the 400m freestyle. An 10km Open Water Swimming event was added to the Olympic program for the first time in 2008. In 2008, US swimmer Michael Phelps became the most successful man at a single Olympic Games by winning eight gold medals. His total medal haul of 23 golds between 2004–2016 is the most out of all sports. See more on the Greatest Swimmers at the Olympics. Anthropometric comparison of Olympic champions in the 100m freestyle. See more on the Greatest Swimmers at the Olympics.